« The Twelve Days of Yule – Day Two and Three! Today is the fourth day of Three Crane Grove’s “Yule Along,” and I’m still following! Today is a day to honor the Nature Spirits. Here in Northern NY, it’s certainly a good day to do that. We’re experiencing a big ice storm. The ice casing everything outside is literally 1/2 to 3/4 of an inch thick! Nature is both beautiful and deadly. Many people have been or still are without power. (Thankfully, we still have power and a warm hearth and home… but the lights have flickered a bit…) Many trees outside are bowed over with the weight of the ice. Many are broken. The roads are slick and people are urged to stay in except in cases of emergency. Days like today give me pause. Despite the cold, the freezing rain, and the miserable conditions outside, Nature will persevere. The plants will be reborn in the spring, and there will still be deer, lady bugs, chickadees, and coyotes when the ice melts. How do they survive? It just amazes me. 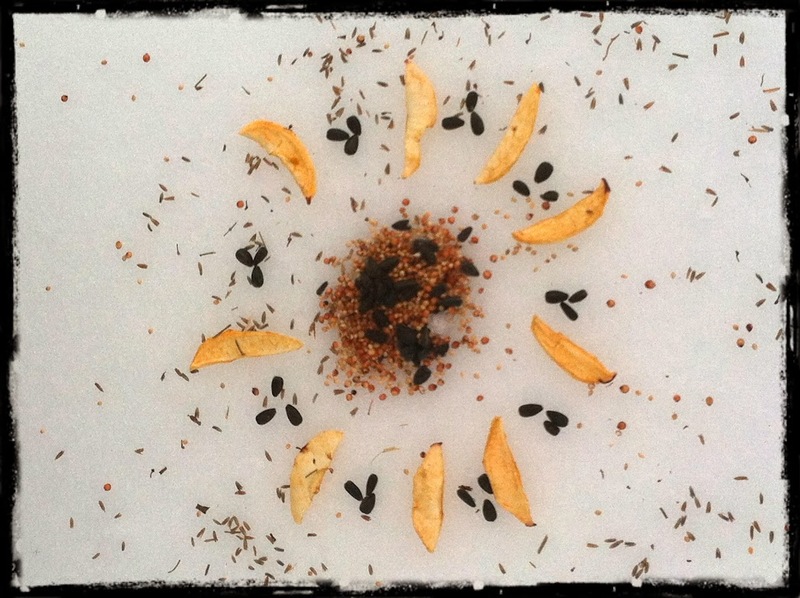 As a small offering for any small creatures out looking for something to eat that isn’t encased in ice, I made a little mandala out of seeds, dried apples, and herbs. The act of making a mandala, however simple and rustic mine is, required me to take off my gloves to place the items. I stooped over for a few minutes to do this and, while it wasn’t that long, it was time enough to meditate on the survival of our brother and sister Nature Spirits. I wish them strength and thank them for inspiring my own strength. 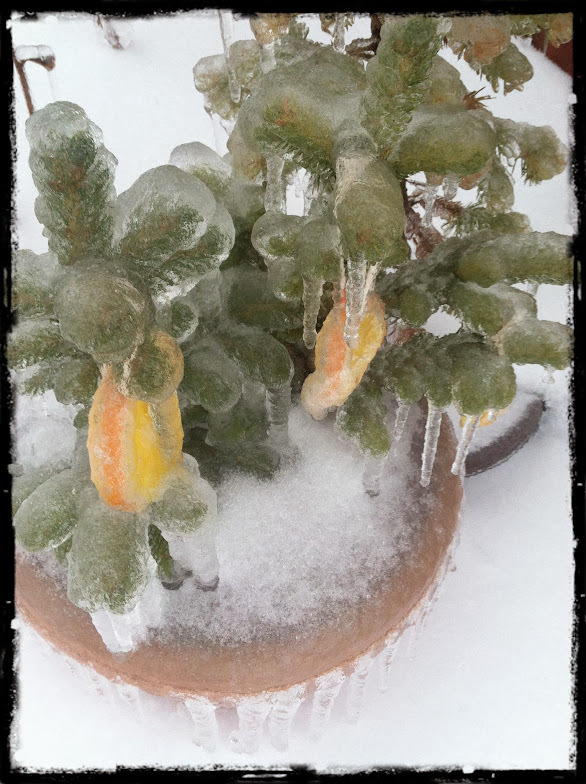 One of our potted trees, completely iced over. Photo by Grey Catsidhe, 2013. 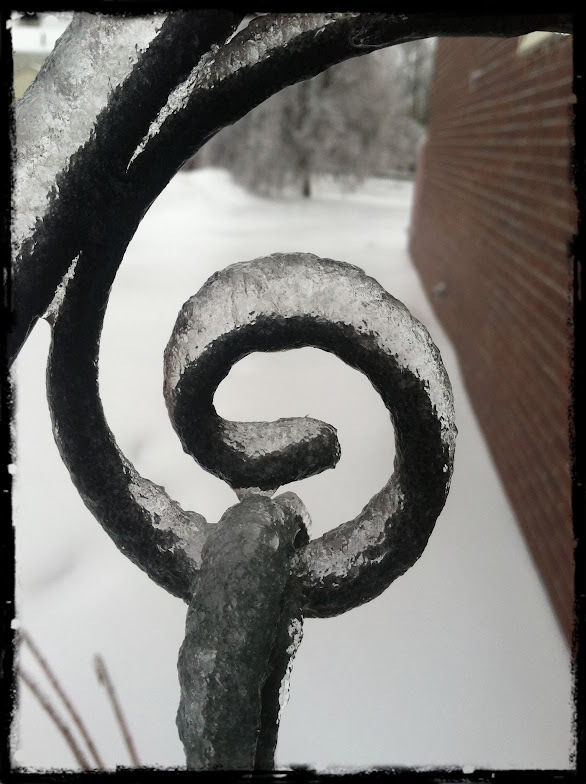 A spiral of ice. Photo by Grey Catsidhe, 2013.